What Happens If I Omit a Creditor from My Chapter 13 Bankruptcy Petition? In any kind of bankruptcy case, it is critical to list all of your known debts on the appropriate schedules accompanying your Chapter 7 or Chapter 13 petition. As a matter of law, your creditors have the right to be notified of your bankruptcy case and to present a claim. If you omit a creditor, even by accident, the court will not discharge your debt to that individual or entity. Another thing to keep in mind: Your debts include all financial obligations that you are legally obligated to repay. For example, if you signed a personal guaranty for a commercial lease or business loan, even for someone else, that is a debt that you must list on your personal bankruptcy petition. You cannot omit such guarantees, tell the judge you just “forgot” to mention it, and then expect a discharge. Consider this recent bankruptcy case from northern Florida. The debtor in this case filed for Chapter 13 bankruptcy in 2011. At the time, he owned and operated a business in the Jacksonville area. As part of his business, the debtor signed a commercial lease approximately two years earlier for office space. The lease included a guaranty by the debtor rendering him personally liable for performance of the agreement–i.e., that he would be responsible for all rent payments and “other costs incurred” by the landlord to enforce its rights. Despite the guaranty, the debtor did not list the lease in his Chapter 13 petition. Instead, he simply defaulted on the lease. Notwithstanding this, the bankruptcy court approved a Chapter 13 repayment plan, which the debtor completed in 2016 and subsequently received a discharge. The debtor then turned around and sued his former landlord, alleging it violated federal bankruptcy rules by pursuing a state-court action against him for breaching the lease back in 2014. The debtor argued his lease guaranty was discharged when he completed his Chapter 13 repayment plan. But a federal judge outright rejected this argument, noting that since the lease guaranty was never listed on the original 2011 bankruptcy petition, it could not have been discharged as a matter of law. 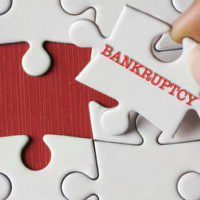 That said, the landlord did technically violate the “automatic stay” applicable in all bankruptcy cases when it continued to pursue state-court collection action against the debtor after he filed for Chapter 13. The automatic stay remains in effect until lifted by the bankruptcy court, and the fact that the debt in question may not be dischargeable is irrelevant. However, the debtor was not entitled to any damages for the landlord’s transgression since he “exacerbated the stay violation by participating in the State Court action,” and not informing the landlord of his bankruptcy case for more than three years. Need Help With a Chapter 13 Bankruptcy Filing? Bankruptcy is designed to give you a fresh start. But you must be open and transparent with your creditors and the bankruptcy court. An experienced Miami Chapter 13 bankruptcy attorney can help you obtain any debt relief you are entitled to under the law. Contact the Law Offices of Julia Kefalinos at 305-676-9545 to speak with a qualified bankruptcy lawyer today.